This is a 2015 update of an article written originally in October 2005, earlier editions published on VK1OD.net which is now offline. This has concerned some people, who took the view that the decline was a harbinger of the impending demise of Amateur Radio. 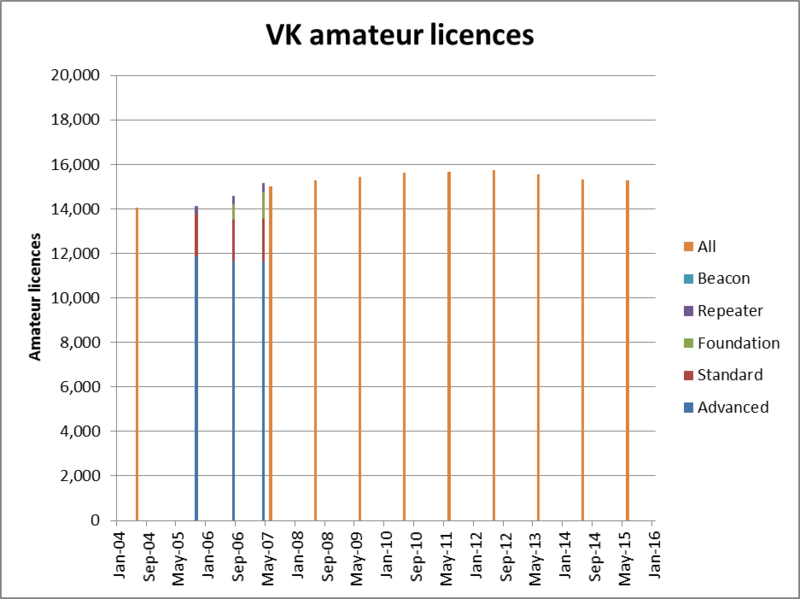 Figure 1 shows the recent history of issued Australian Amateur licences. The licence numbers shown in the graphs at Oct 2005 are aggregated on their equivalent type under the changed Amateur LCD which came into effect shortly afterwards. Note also that the figures include clubs licences, beacons, and repeaters. Figures post April 2007 are not broken down as the breakdown has not been published by the WIA or any other organisation. Clearly the growth rates of almost 6% pa attained up to April 2007 have not been maintained since then. Growth in all amateur licences June 2007 to June 2008 according to the ACMA 2008 Annual Report was much lower at 1.8%pa. 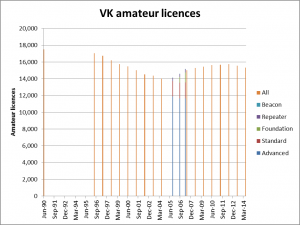 It is interesting that of the 858 Certificates of Proficiency issued, only 12% of the certificates were Advanced, a strong indicator of reduction of Advanced licences from 85% of the licence base at October 2005. It is also notable that although 858 certificates were issued, and at least the 588 Foundation certificates represented potentially new licencees, licence numbers grew by only 269 for the same year. The underlying attrition continues, and it is likely to be mainly in the Advanced grade as amateur radio is dumbed down to a populous social hobby and Foundation Licencees reshape ham radio. The WIA published a breakdown of licences at 1 April 2007. Note that it is difficult to reconcile the WIA’s published figures with the ACMA’s annual reports. On the WIA’s published figures, the number of Advanced equivalent licences have declined at a rate of 1.33% pa from 04/10/05 to 01/04/07. This includes club licences which are usually pretty stable, so the number of individually held Advanced licenses is likely to have fallen by even more than 1.33% pa. It is interesting to note that in that category are the then Limited and Intermediate licencees who obtained increased band access with the recent licence reforms. So whilst we have gained 1186 Foundation licences and 85 Standard licences, we have lost 235 Advanced licences. Figure 2 expands the licence statistics for the last two observations, and it shows the 4.08%pa increase in overall numbers, and the 2.36%pa decrease in Advanced Licences. The information on Australia’s main amateur radio training site Radio & Electronics School suggests that students should expect to be able to complete the Advanced course in about 66 hours in addition to the regulations and practical components which suggests about 80 hours of training activity in total for the Advanced licence. By contrast, the training investment in the Foundation licence is more like 6 hours. When the increases and decreases are weighted by the relevant skill level or training investment, we have taken a step backwards. That should be a concern to all amateurs, and to the WIA. But apparently the WIA sees this as an unqualified success. 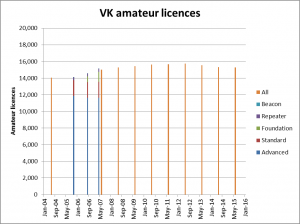 A story Australia reverses amateur radio’s downward trend – Amateur Numbers continue to grow on Southgate ARC and attributed to the WIA calls this out as a success “For those who have not yet heard, the great news is out. We have finally reversed the trend of our declining amateur population and we are now in positive growth mode!! “. The graphs above have been updated for new data from the latest ACMA Annual Report. 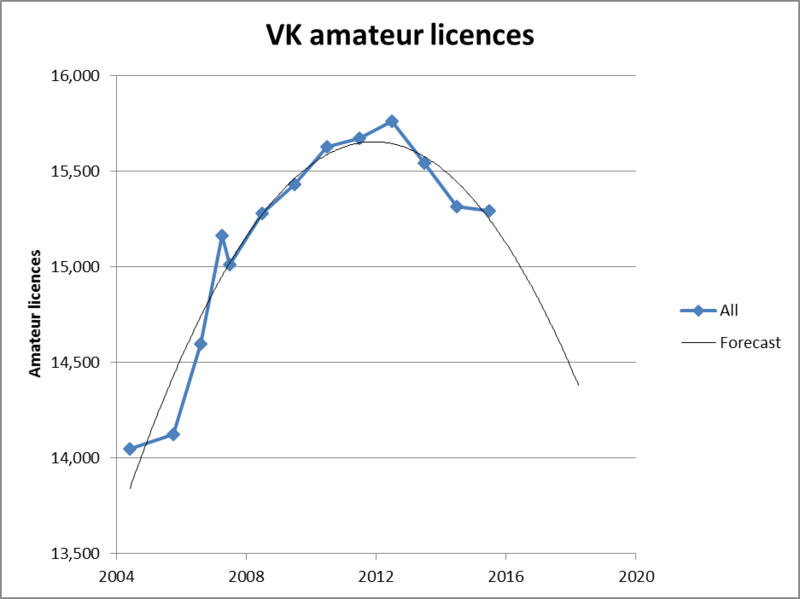 The ACMA’s annual report reveals that in FY 2014/15, there was a decrease in total amateur licences was just 23 licences or 0.15%. The total at June 2014 at 15,293 is approximately the same as at June 2000 and just 1246 higher than the number 11 years earlier prior to the introduction of the Foundation licence. The more interesting question is the dissection of the total into the numbers for each grade and the trend. 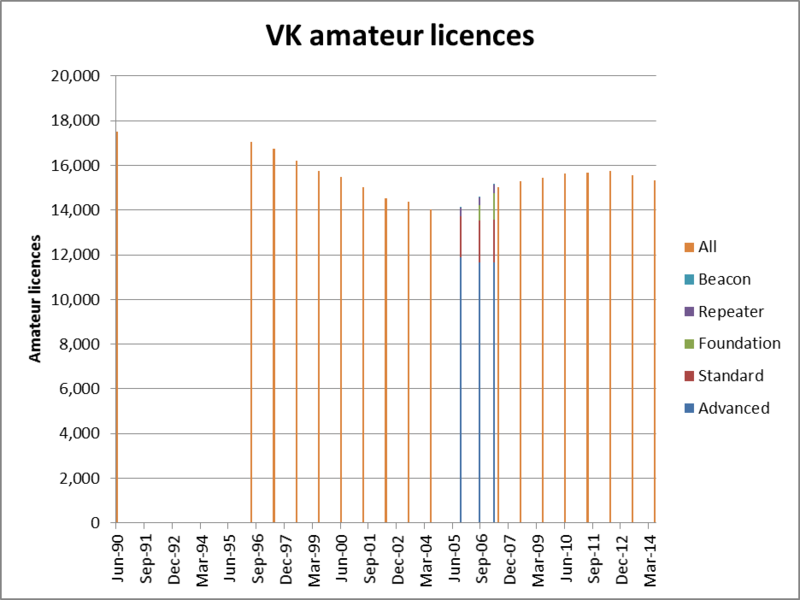 Fig 3 shows the total issued licences over the years since the introduction of the licence reform which introduced the Foundation licence and gave significant additional privileges to all existing licencees except the ‘full’ licencees. The trend in the total is that it is decreasing. Fitting a polynomial curve to the data gives some insight into where it might be heading. My forecast in 2012 based on that model was that licence numbers would peak between 15,000 and 16,000 around 2014 and to then resume the decline that was apparent in the 1990s. That has indeed happened, licences peaked at 15,760 in 2012, and the decline is not only evident, it is a more than the 2012 forecast. 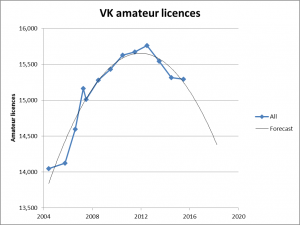 Whilst the number of licenced amateurs is not a valid indicator of the health of the hobby, this trend will probably cause hand wringing in some quarters, especially the WIA whose economic viability is linked to subscription numbers and we can expect another wave of dumbing down to try to prop up membership. Data prior to 2001 was from IARU statistics published on their website. Data from 2001 to 2004 is from the ACA Annual Report 2004, Oct 2005, Aug 2006 data is from the WIA website, April 2007 data is from the WIA AGM reports. Data after April 2007 is from ACMA Annual Reports.